Li Tang's signature appears on a pale spindly background peak to the left of the central mountain in this painting. It reads, "Painted by Li Tang of Heyang in the spring of the ‘Jiachen’ year  of the Xuanhe Reign of the Great Song (皇宋宣和甲辰春河陽李唐筆)." Here, Li Tang has portrayed the rugged, powerful features of a mountainous scene. 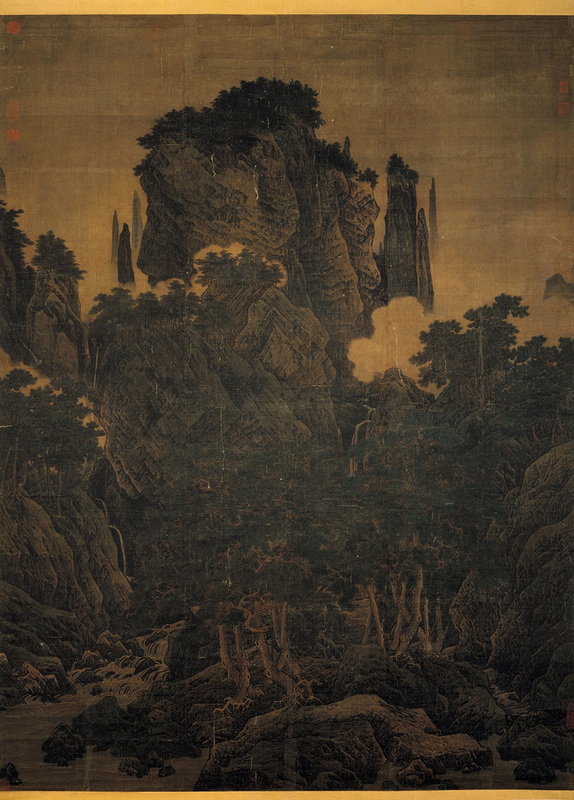 Although the central mountain dominates the composition, as seen in other monumental landscape paintings of the Northern Song, the foreground scene presents a more intimate setting that ultimately became popular in Southern Song painting. The rock faces and mountainsides give the appearance of wood chopped with an axe. These strokes later became known as "axe-cut" texture strokes (斧劈皴) and are often seen in Southern Song court and professional painting. This type of brushwork is ideal for suggesting the sharp features of rocky landscapes and eroded slopes. As for the puffs of white clouds in the middleground, they not only appear to move (adding a sense of dynamism to the scroll) but also serve as backgrounds for highlighting the rocks and trees in front as well as for dividing the composition. The clouds, furthermore, provide a contrast for the jagged rocks, softening the features of the painting while opening up the composition. Distance is suggested by large pines in the foreground compared to the distant background forests, and a winding rocky path also adds depth and serenity to the composition. Cascades on either side of the central mountain fall from the heights, are broken up by the rock forms, and end up as the rushing stream in the left foreground. The movement of the water stands out so vividly in this placid valley that it almost seems audible--surely something that a master painter like Li Tang would have intended.